Power your LED hoop with a single AA battery, rechargeable or alkaline. It can power 21 LEDs for about 3 to 4 hours and can be swapped out for a fresh AA at any time. Perfect for hooping off the grid, in the desert or on the road. Carry a few AA’s and you are set for hours of hooping. Swap batteries in a flash. Never wait for a charge again! The basic kit includes one AA circuit module and one AA battery holder. You’ll need to solder the AA module to the switch, LED wires, and battery holder according to the diagram below. So this is not recommended for beginners or those who have not soldered before. Read full instructions before purchasing this kit. If you want a kit that includes these 2 parts plus the connector, wire, and switch you will find it as option 2 on the Maker Kit page. In order to swap out the battery you’ll need to open your hoop, so you will want to file down one end of the tube connector so it can be easily pulled apart, if that had not already been done. NOTE: you must use a minimum of 7 LEDs in your hoop with this system. Connecting this system to fewer LEDs will over-drive your LEDs with too much current and damage them. So do not connect less than 7 LEDs even when you are first attaching you LEDs to your wire. In order to check the 1st to 7th LED during your build you can use 2 or 3 AA batteries, a 3V lithium coin cell, or buy a used lithium test battery. Click circuit diagram picture to enlarge. Hi there! I was just at Ultra Music Festival and a girl let me borrow her LED hoop, and she said she got the kit from you. So now I’m thinking of getting a DIY from you, and am trying to figure out the best battery option. I’m thinking that the AA’s may be a good idea. Is the AA option just as bright as the regular batteries and the rechargeable? And when assembling the hoop, do I follow the same instructions? Thanks!! Im not surprised to see ProdMod hoopers are so friendly. The AA option will be just as bright as the standard non-rechargeable battery. But not quite as bright as the rechargeable version. If you want to make it really bright you can add another AA battery to it in series, but it takes more room away from the LEDs. Keep in mind the AA option requires some soldering at least to the switch. You can buy it pre-soldered by choosing the option above. Either way you still need to connect it to the LED wire and battery holder which can be done by soldering or twisting the wires together and taping. Follow the basic hoop instructions until you have to install the switch at Step 10. Then follow the diagram above to insert the module and switch. You don’t attach the battery holder until after you install the tube connector in step 11. You mention that the hoop lasts 3 to 4 hours on one AA battery. How many LEDs are in a hoop that lasts 3 to 4 hours? Is it 7, or will it last 3 to 4 hours with more LEDs? sorry I guess it creates ambiguity with that statement of 7 LEDs. I’ll change the wording above. I tested this AA circuit with 21 LEDs and it lasts 3 to 4 hours. I’d have to test it with different amounts of LEDs to tell you if it would last longer or shorter. Did I answer your question so far? Just assembled 21 light purple led’s with the AA Upgrade…There does not seem to be enough juice to power the LED’s it looks like a minimum of 3 volts when I hook it up to a power supply…After completing the wiring, the circuit module does not seem to allow any current through. Any advice? I heard another buyer mention similar issues with UV LEDs. I am out of town now but plan to address this when I return next week. It may need a different circuit. I`ll post about the solution as soon as I have it. I just re-tested this AA circuit with 21 light purple LEDs and 21 UV LEDs and they both light up fine. 7 LEDs will be brighter than 21 but non-the less they all light up. Are you sure that the orange and green wires are connected to the LEDs and red and black is powered by one AA battery? I used a single AA NiMh with 2700mAh. And I also used a 1.5 V Duracell alkaline battery. both worked fine. The alkaline was a bit brighter. Also you must be sure never to power the circuit until after you connect LEDs to the orange and green wires. Powering the circuit without LEDs properly connected WILL damage the circuit. I really want to make some mini LED hoops with 3/4 OD tubing. Would this battery system fit in the smaller tubing? The AA battery holder is actually too fat for the tubes that have inner diameters of 0.625, which is typical of the tubes with 3/4″ outer diameters. But you could use a AAA holder instead. Downside is that the hoop wont last as long with a AAA as it does with a AA battery. what exactly is the circuit module and what does it do? Ditto to the question above. Is it a step up converter? Is there any chance of you sharing the secret (circuit) with those of us that are obsessed with DIY? hey wait a minute, 2 separate posts on the same exact topic within minutes of each other? This never happened before. Can you tell me how you found my site and what prompted the question? If you both reached my site by referral from another site it would be great to know. Anyway, about the circuit. Yes its a step up converter, it takes the low voltage from one battery and boosts it to about 3 volts. Its not much of a secret circuit, you can find schematics all over the web. Do you need it for an LED hoop or something else? haha, that’s gotta be just dumb chance we posted the same time, or it’s secret knowledge sought after but were too afraid to ask! Thanks for the help, I’m building hoops to our specs and just needed some guidance. Great site BTW, I can’t wait to see your future development on the color changing and strobing hoops!!! I think my new colorsync hoop is pretty awesome. And I have a 2nd secret hoop to reveal soon as well. I think I’ll auction off the first few I build on ebay to gauge interest. Stay tuned..
also to better keep in touch you should subscribe to my feed. you’ll see the button at the bottom of the right hand column. I don’t post everyday, so you wont get bombarded. I’ll post when I have something new and cool to report. The work and info you have shared are definitely an inspiration. Lucas’s post did prompt me, but it was chance that I saw it on the same day posted. I’ve made a couple of LED hoops with christmas light type circuits and 4 aa recharegables, also an el wire hoop. I’m new to the world of electronics and mad scientist projects help with the learning curve, otherwise I would have already bought the aa circuit from you. I learned about your site through Maker’s Faire and web searching. I’m now trying to make a hoop with rgb multimode stuff and am hoping to use 1 aa battery. Thank you much. Hi, I’m hoping my hoop turns out similar. I’m in the process of figuring out how to adapt a mini-controller from Big Clive and hoping I can actually pull it off. I’m working on a similar LED-circuit but with a diffrent purpose. As with the hoop, I don’t have much room to spare to put batteries. So I’d be working with one AA battery->step-up converter and ouput 3.3 V to 3 white LEDS. Btw, if you can tell me the productcode of the step up converter you’re using, would be great. All converters i can find require at least 1.8 V input. I’d be working with only 1.2 V.
OK, well its not just a step up converter, its primarily a current boost regulator. When powered by a single cell it raises the voltage to whatever it needs to keep the current around 150mA. To keep the LEDs in the hoop below a safe current range of 20-25mA I take my total current and divide by 20mA. So 150mA/20mA = 7.5 LEDs. That is where the 7 LED limit comes in. You can probably use less and source more than 25mA to each LED but I’m playing it safe here. If you connected it to your 3 LEDs in parralel you would get 150/3= 50mA per LED. 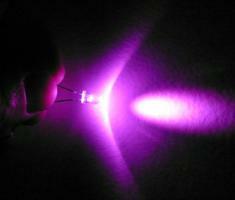 Some high powered LEDs can handle this easily. So look at your LED spec sheet. If your LEDs are rated to handle 50mA then you are ok. If not you risk overheating and damaging your LEDs. And if your LEDs are rated for more than 50mA then you wont be turning them on fully with this circuit and one battery. But you can add a 2nd battery and produce 300mA total current, or 100mA per LED. Hi, I ordered the components to build a hoop several months ago, and completed the hoop recently. I was so excited to see it light up!!! About two days after I completed it it wouldn’t light up and the hoop got hot near the switch and battery area. I’m wondering if you might know what the problem could be. I would love to get more parts and/or fix the problem with this hoop. I don’t want to re order everything if I don’t have to. Festival season is upon us and I would love to have a LED hoop this year. What do you recommend? (The hoop was a replaceable AA set up with 21 LEDs). hello, can you please tell me if the aa circuit module will fit in the smaller sized tubing? i know that you say that your rechargeable battery doesnt fit, but if i used this aa upgrade with the circuit module will it fit? THANKS in advance! The AA module circuit, the little black cube, is only 1/4″ tall so it can fit almost any tube. But the AA battery holder is 5/8″ wide, and is a bit wider with the AA battery installed. It definitely will not fit in the 3/4 OD tubing. But it can fit into 7/8 OD tubing if you force it in. I would recommend sanding down the corners of the battery holder, otherwise it wont be easy to take out. im gonna use the 7/8 so perfect answer, thanks! thanks for the kit, so i have slow color changing bulbs wired together and when i test them with one AA battery , you can barely tell they come on and they only do one color (red). but if i test with two AA batteries they work great. I tried an individual AA from a second package, thinking the first was no good. Could be two bad batteries, but unlikely. any other ideas?, my connections are tied but not soldered, all bulbs light. 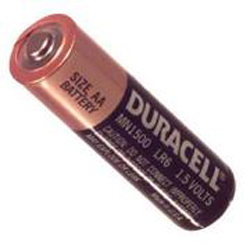 I am assuming when you say you used one AA battery that you connected it to the AA circuit sold on this site, correct? If you are using brand new batteries out of the box I doubt you would get two bad ones, unless they are a cheap brand. Be sure they are alkaline, not carbon. And if they are rechargeable, of course, recharge them. Did you also follow the instructions on this link for the AA circuit? Its sensitive. The first 3 rules are important to avoid damaging your circuit. If you connected your battery to the circuit before connecting the LEDs you have damaged the circuit. Aside from all that, my common response is to look for short circuits in your construction, and double check that all LEDs are installed with proper polarity. it only takes one bad LED to mess up the string. Hey i was wondering what the max output of the aa circuit module was in ma? 350ma? Thanks! This a remarkable website!. 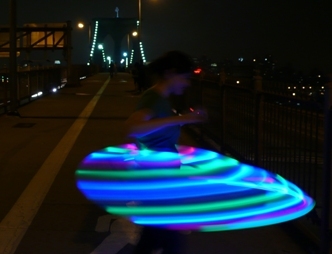 Re: DIY LED Hula Hoop New Ideas thread.